Neighbors snacked on organic chips cheese and dip provided by Roberly Hearsh and yummy fresh peach cake with yogurt frosting that Heather made in honor of David Saul’s last day on the SEN board. Duncan Rhodes has a standard bulletin Board suitable for a park kiosk and would like to recruit neighbors to form a committee to work with the city to get the bulletin board installed at Tugman Park. Contact Duncan via email @ Duncan.Rhodes@cerrillos.net to get involved. May 29 is Trot De France (formerly known as the Jog-a-thon) at Charlemagne School. Watch out for kids jogging in the vicinity. May 30 is our next work party at Tugman Park (9am – noon). We’ll be addressing several issues to keep the park looking great. Tools and gloves are provided by Parks & Open Space. Our local CERT group is planning a Fire Safety event at the Safeway on 40th Ave at Donald St on May 30th. Time still to be determined. Amazon Headwaters fundraising for legal debts is ongoing. Over $5,000 has been raised to date but we still need to raise additional $29,000. Jennifer Knapp, Urban Designer leading the South Willamette Concept Plan project, gave a brief overview of the Concept Plan and the design code currently being developed for the South Willamette Special Area Zone to implement the concept plan. She shared some upcoming dates for project milestones and opportunities for public input. The Planing Commission recommendation is expected to go to the City Council by fall of this year and there will be work sessions and another public hearing before the city council will vote to adopt the Design Code. Visit the South Willamette Special Area Zone page on the city website to get more detailed information. Chris Henry, Transportation Planning Engineer leading the project gave a brief presentation on the status of the project that will be making some major changes on Willamette Street between 24th and 32nd avenues. Construction to prepare for a 1 year pilot test of the 3 lane street design will start in July 2015. A permanent traffic signal will be installed at the Woodfield Station driveway on Willamette and Willamette street will be widened north of 29th Ave to tie in to the existing bikeway system and leave enough space for a left-turn lane for southbound traffic on Willamette at 24th. 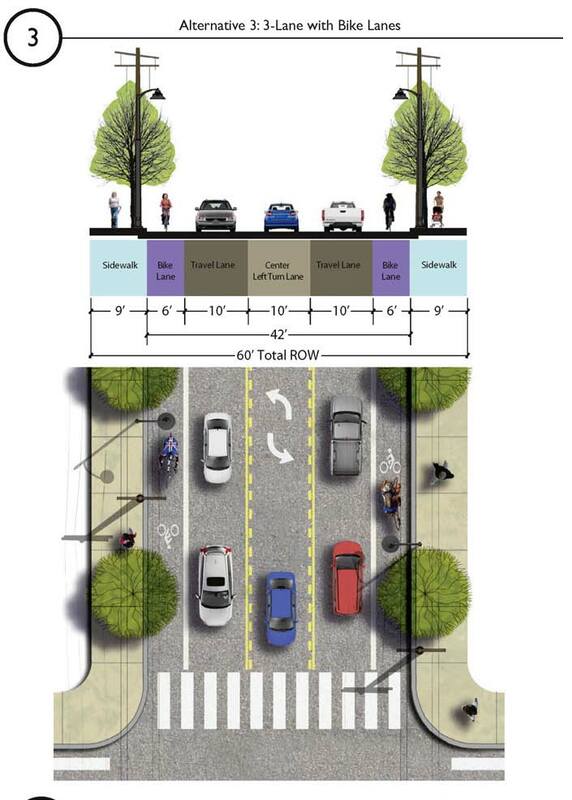 Willamette will then be temporarily re-striped with two southbound travel lanes, a center turn-lane, one northbound travel lane, and bicycle lanes on both sides of the street. North of the 29th Avenue area, the test re-striping will include one travel lane in each direction, a center turn-lane, and bicycle lanes on both sides of the street. The pilot test period is preceded by a 3 month adjustment period and will last 12 months. Jennifer and Chris fielded a number of questions from the group after their presentations. The meeting adjourned at 8:30 PM. May 15, 2015 in Meeting Minutes, Meetings.